The SB Acoustics woofers are known for exceptional performance and value. SB Acoustics drivers are designed in Denmark by engineers with many years of experience working for major Danish loudspeaker companies. The engineering capabilities, coupled with the state of the art manufacturing facility in Indonesia, provide you with a product unmatched by other companies. This system uses the long stroke 12" subwoofer SB34SWNRX-S75-6 woofer. This woofer features a stiff composite paper cone with rubber surround. The 11mm linear excursion assures good control at very low frequencies. 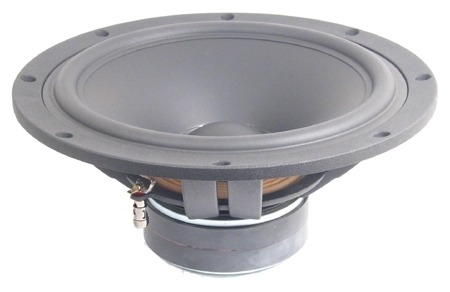 A 3" diameter voice coil provides good power handling and fast response. It is important to use a large magnet system to power a 12" speaker. 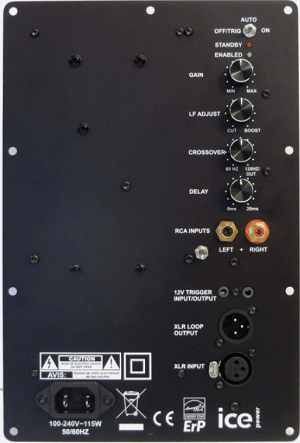 We've paired the SB34 sub with the new Speaker Lab Subwoofer amplifiers made in California USA. Blending the SB34 Kit into your stereo system is a breeze thanks to the Speaker Power. 2.8 to 3.5 cubic feet with 3" diameter vent by 12" long for an F3 of 28 to 27Hz. You are within X-max at 200 watts. The kit price reflects a 10% discount on all the parts. SB Acoustics was formed to bring an alternative to the hi-end transducer market. Marrying the design talents of Danesian Audio (Denmark), a company filled with industry veterans, responsible for many well known and revolutionary designs, and manufacturing partner Sinar Baja Electric (Indonesia), a vertically integrated company with more than 27 years of transducer manufacturing experience.